Get ready for Donald Trump-branded socks and beauty salons in China. 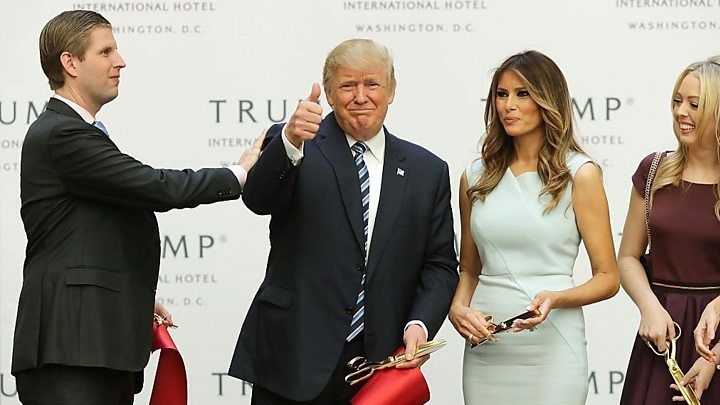 Authorities in China have provisionally approved nine more trademarks for the Trump Organization that had previously – and inexplicably – been rejected. The company now owns the right to use the Chinese version of Mr Trump’s name for various products and services. It comes as the US President fights allegations that his businesses create potential conflicts of interest that may violate the constitution. Three lawsuits, including one by nearly 200 congressional Democrats, have been filed against Mr Trump because of ethics concerns. Critics claim the number of approved trademarks has accelerated since Mr Trump entered the White House. Mr Trump ceded control of his namesake company to his two eldest sons after taking office but retains ownership of the assets. The same goes for his daughter Ivanka Trump, who has a formal White House role as assistant to the president. China has granted formal approval for at least 125 Trump-related copyrights, according to the country’s trademark office website. The Trump Organization now own the rights to products such as golf clubs, restaurants and bars, as well as services for massage parlours and social escorts. The Trump Organization’s lawyer has said the filings are to defend its brand in China given the country’s reputation for counterfeiting. Mr Trump also reportedly applied for trademarks using the name of his ex-wife, Ivana Trump, more than a decade ago. ← London fire: How are fires fought in high-rise blocks?